No shortage of alternatives as materials, packaging and architectural options grow, and plenty of startups are jumping in. The rising cost of developing chips at 7nm coupled with the reduced benefits of scaling have pried open the floodgates for a variety of options involving new materials, architectures and packaging that either were ignored or not fully developed in the past. Some of these approaches are closely tied to new markets, such as assisted and autonomous vehicles, robotics and 5G. Others involve new applications of technologies such as AI across a broad swath of different markets, or cloud-type hyperscale architectures in data centers. What’s changed over the past 12 months or so is there are now more choices—and increasingly more nuanced choices. It’s no longer just about picking a processor or memory based upon a particular foundry process. This shift has ramifications for the entire manufacturing sector, as evidenced by GlobalFoundries’ decision to stay put at 14nm and scrap plans for 7nm. UMC likewise has stopped at 14nm, at least for now. Both continue to offer multiple finFET-based processes, but they are simultaneously expanding efforts in other directions. GlobalFoundries, for example, is betting big on FD-SOI, while UMC is pushing heavily into automotive. Benefits are still to be had in scaling to 7nm and beyond, especially on the low power front. One of the big concerns has been dynamic power density, but new technologies such as gate-all-around FETs likely will ease that problem because they can operate at lower voltages with less static leakage. An estimated 20% improvement in performance can also be gained from moving to the next node, and while that’s lower than the 30% to 50% gains of previous nodes, it’s still significant. But cost remains a major factor. Behind all of these developments, the economics of developing these devices is shifting. Multiple reports and analyses point to 3nm design costs topping $1 billion, and while the math is still speculative, there is no doubt that the cost per transistor or per watt is going up at each new node. That makes it hard for fabless chip companies to compete, but it’s less of an issue for systems companies such as Apple, Google and Amazon, all of which are now developing their own chips. So rather than amortizing cost across billions of units, which chip companies do, these companies can bury the development costs in the price of a system. Chip companies clearly can’t do that, so they are pushing in a number of completely different directions. And this is why the semiconductor industry is exploring a variety of new options. But as they look at different options, it also begins adding uncertainty into how much volume foundries and equipment makers can expect to see at the most advanced nodes. And that, in turn, affects how quickly capacity needs to be added and how much they invest in new processes, equipment and materials. Capacity limitations force greater efficiency on the supply chain. As a result, specs get tighter, design rule decks grow larger and process development kits include a substantial amount of margin, Chen said. This carries over into the materials world, as well. There are a slew of new materials being introduced for a variety of reasons, some involving power, some for cost, others for reliability. Intel, for example, is using cobalt for some of the metal layers to reduce electromigration, which can impact chip reliability, while using copper for other layers. Also III-V and II-VI compounds are being used for a number of specialized applications, each offering different sizes of bandgaps. Rather than starting from scratch, though, most of these materials have been at least partially vetted in recent years as researchers prepared for both higher density manufacturing and a simultaneous slowdown in Moore’s Law. This is particularly important in semiconductor manufacturing, both for yield and end-market reliability reasons. As chips find their way into more industrial, automotive and other safety-critical applications, reliability is a growing concern. FD-SOI is a prime example of this, and it offers another option to the rising costs and limited capacity at the most advanced nodes. FD-SOI has been in use for the better part of a decade, providing better insulation as well as body biasing using existing silicon manufacturing technology. But their use has been limited. As semiconductor economics shift, and as new technologies such as 5G and AI roll out, demand is increasing rapidly. Edge devices will be a key driver of FD-SOI. In the past year, there has been widespread recognition that too much data will be generated by sensors to process everything centrally, so more computing will need to be done at or close to those sensors. Chips based on FD-SOI are significantly less expensive to develop than finFET-based devices because they don’t require multi-patterning at 22nm and above, and they can run at significantly lower power with less concern for leakage than other planar implementations. Alongside of all of this, in what amounts to yet another hedge for foundries, is advanced packaging. This approach of adding multiple chips into a single package is supported by all of the major foundries as well as all of the large OSATs. Packaging is not new, but it is getting much more attention these days. It also is getting more complex. And it is raising questions about whether packaging ultimately will impact scaling, or whether advanced-node chips will be used in packages alongside other older-node chips. There are multiple reasons to continue scaling. Packaging adds its own set of challenges and benefits. There is a huge amount of work underway across the semiconductor supply chain to improve the tooling for advanced packaging, which would add some consistency into the design flow, as well as experimentation with a number of options ranging from fan-out to 2.5D, 3D-IC, system-in-package and even chiplets. Most experts believe it will take several years before this becomes mainstream enough to have a big impact on cost and time-to-market, but advanced packaging already is in widespread use in consumer devices, networking chips and in a variety of customized applications. What remains to be seen is whether logic and memory developed at 7nm and below will be incorporated into those packages. Alongside of all of these developments is a push toward more heterogeneous architectures. Rather than a single processor, the emphasis is now on accelerators for specific types of data. The rapid proliferation of AI has made this an all-out race, with an estimated 30 startups developing accelerators or fully integrated chips to speed up performance by 100X or more. That makes performance gains from scaling look minuscule, but these chips are so specialized that they need to be mixed with other chips. Moreover, AI/ML/DL isn’t necessarily good for everything, so while chip architectures can be honed for specific applications that doesn’t necessarily mean everything will run at 100X performance. Some AI chips are enormous, and they typically have arrays of accelerators coupled with small memories in very close proximity to those accelerators. The challenge from the design side is how to keep all of these processing elements busy. 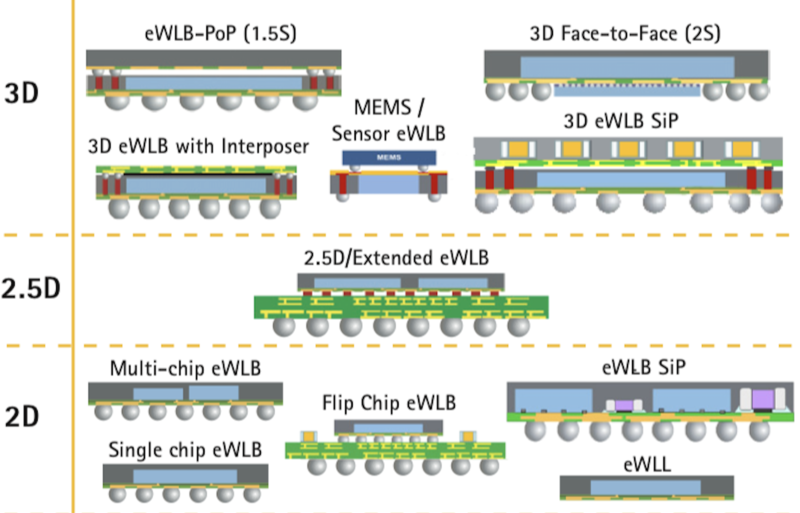 The challenge from the manufacturing side is how to produce these complex chips with so many heterogeneous elements, where the starting point is the data rather than the manufacturing rules deck or the standard design flow. This is particularly difficult in edge devices, where at least some of the processing needs to happen in real time. How these constantly evolving architectures get designed, manufactured and packaged isn’t entirely clear. What is clear is there is no shortage of new options emerging, and not all of them will work out. That makes it hard for foundries, equipment companies and materials suppliers to make long-range plans, which is why many are proceeding cautiously. In the past, there was a roadmap and a clear direction for investing in the future of chip design through manufacturing. That roadmap no longer exists. Which approaches and technologies win, and which ones fail, is anyone’s guess. But each one of those options requires a substantial investment, and it’s hard to bet the bank when you don’t know how long those options will stick around.